This release adds a new option to prevent project data being accumulated for out-of-scope items that pass through Burp Proxy. It is common for users to configure their system-wide proxy settings to send all traffic through Burp, with the result that a large quantity of irrelevant requests and responses go through Burp Proxy, generated by OS components, other software, or unrelated browsing by the user. 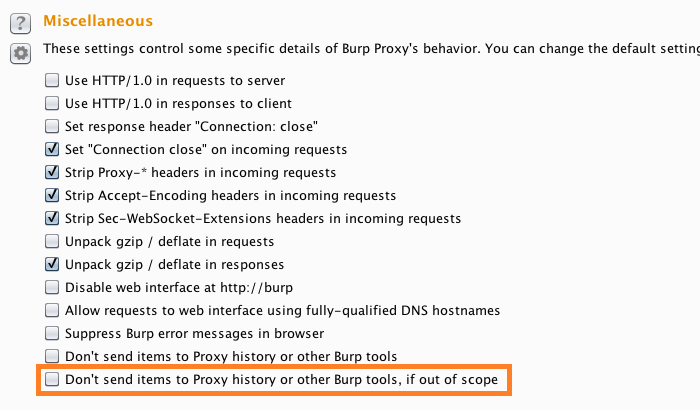 With the new feature, you can prevent out-of-scope items being added to the Proxy history or Target site map, or being automatically sent to other Burp tools (such as for live scanning). A large number of minor bugfixes and other enhancements have also been made.